We have had a beautiful summer so far, with enough rain and plenty of sunshine to make everything grow lush and green! But I have managed to sneak in a little bit of sewing. I get inspired by all kinds of things, but the best ideas sometimes come from customers. This steam punk tissue cover was a request from a customer from the UK! A mix of vintage/tech, clock faces and gears are frequently seen in items for this world-wide sub-culture. I hope to have a few more items made from this fabric in stock soon! Last year I had many requests for sets of coasters. 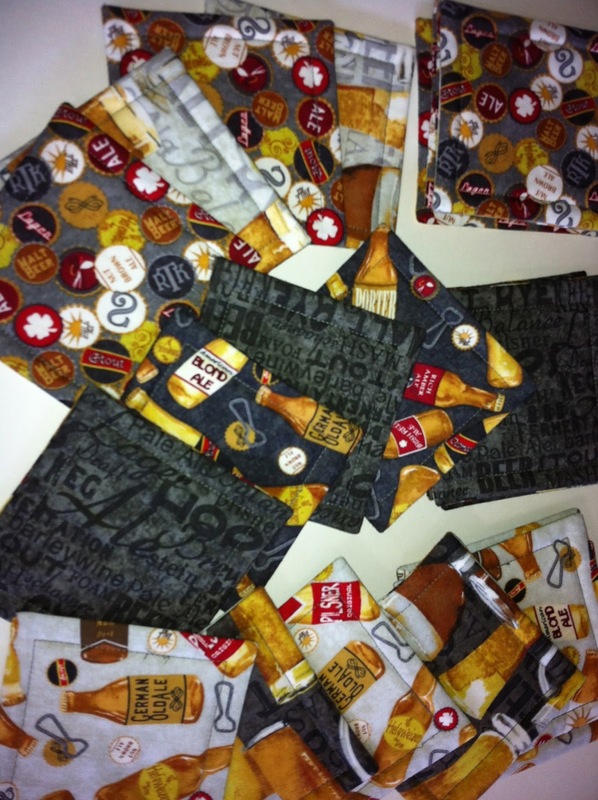 Because many hand made things are geared for the woman, I picked up this beer fabric to make something a little more manly. These are perfect for the Man Cave or as a stocking stuffer for the guy who is into making his own brew! And finally, these blue and white blocks are taking a bit to get finished, but I hope to have the top of this quilt put together by the end of this week. I love this colour combination and when my customer sent me the picture of what she wanted, I was excited to start on this quilt as the picture was one I had bookmarked as a quilt on my bucket list! Do you have a project on your bucket list (quilting or otherwise?) Where do you find inspiration? WIP Wednesday - August 6 - Christmas Inspiration!